Architect, Peter Newlin, of Chestertown and an Annapolis architect have recently been awarded top honors by the Chesapeake Bay Chapter of the American Institute of Architects (AIA). The honors were given at the chapter's fifth annual awards program held at the Sheraton Hotel in Salisbury. Participating in the event were members representing both shores of the Bay, including Annapolis, Chestertown, Easton and Salisbury. Newlin, president of Chesapeake Architects, received his Honor Award for his House at Tolchester Beach. Annapolis architect Ferdinand Johns won his for the Greystone Hardware Building in Annapolis. Submissions were judged and the awards selected by a nationally acclaimed panel of three New York City architects. Chairman of the jury was Deborah Berke, AIA, of Berke and McCurdy Architects. Berke was joined by Carl Meinhardt, FAIA, and Andrew Bartle, AIA. Berke strongly commended "both architects and owners for their vision of quality in building and art in building design." The jury praised Newlin's Tolchester Beach House for "careful detail and its multiple use of a tweaked traditional form." Newlin Explains: "The house is composed of five identical pavilions with edges that overlap one another." 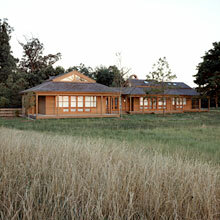 The pavilions are derived from the Eastern Shore hipped roof barn. "We took this form and made it subtly elegant. 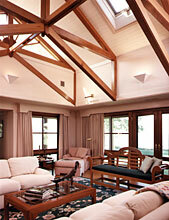 We wanted a peaceful house which sits restfully in its Bayfront environment." The house's five identical pavilions house the owners' quarters, guest quarters, living room, dining/kitchen/porch and breezeway/garage. The pavilions overlap, except that between the sleeping quarters and living room there is an entrance hall, Newlin said. "The overlaps are informal, giving this sophisticated house a feeling of rural ease." Newlin says, adding, "I sought the repose that sheep have when they stand together, shoulder to shoulder."